Confession: I expected to be totally bored by this book. 1. It had gotten a fair amount of buzz on the blogosphere, which always makes me suspect that my expectations might be too high and I might be the ONE person who is completely underwhelmed. 2. The Scientists in the Field series is pretty hit-or-miss with me. Some I've loved and some I really haven't. 3. It's about ocean currents. And trash. I was not entirely convinced that I cared about either one of those things. Confession #2: I was wrong! I loved this book! In fact, I think it's my favorite of the Scientists in the Field series so far. 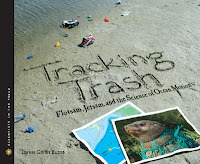 Tracking Trash is about ocean currents, yes. But the cool thing is how these particular oceanographers study ocean currents. For Dr. Curtis Ebbesmeyer, his studies started with a sneaker. Well, a case of sneakers. A case of sneakers that fell off a ship during a storm and began washing up on beaches from Alaska to northern California. What currents brought those shoes to rest on shore? What paths did they take? Why did some of them go north and some go south? By studying the effects of accidents like this one, scientists are learning more and more about the patterns of the ocean. Maybe someday this can help us clean up the sea. You see, some trash washes up on the shore. Other trash floats around in the middle of the ocean, sometimes creating giant islands of trash. Much of this trash is plastic and that's a big problem because plastic will break into smaller pieces, but it will never break down completely. This plastic can be harmful to animals who eat it or who get stuck inside plastic pieces. One problem in the ocean is "ghost nets" or nets that have been cut or wrenched loose from ships and now float in the ocean. They still do their jobs - they still catch animals - but now they're killing animals for no reason. Animals also eat plastic pieces and can die from it. It really made me think about how much plastic I use every day. I was reading the book in bed and I looked over on my nightstand and quickly counted the plastic things there. My alarm clock, a Chapstick, a remote control, two water bottles, a lotion bottle, the cap to my nail polish, two loose buttons, and the pen I used to write my notes with (not to mention the Mylar cover on the very book I was reading). That's 10 pieces of plastic within two feet of me. I use so much plastic every day and I never really thought about where it ended up when I was done with it. It's certainly gotten me thinking about the three R's: reduce, reuse, and recycle. This is another great book to use for Earth Day or any day. An interesting science book that will appeal to reluctant readers because it's so unusual. No wonder it was a finalist for a Cybil (read the review posted at the Cybils page). And you'll definitely want to check out Ms. Burns's blog. Thank you for the kind words, Abby. I am so glad TRACKING TRASH won you over!